Wow! About a year ago (really?! Almost a year!) I wrote a blog post featuring a Bean and Bobert comic missing the punchline in the attempt to create an interactive comic strip. The idea was to have a punchline randomly picked from a handful of pre-loaded punchlines (that you and I provided) after scanning a QR code. I’m accustomed to publishing my comics online but the QR code idea requires a blend of real world with mobile app. That’s when I asked my friends at the Gateway to see if they could squeeze the strip in amongst the other talented cartoonists’ comics on dead-tree paper format. 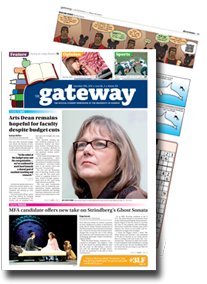 I’m very fortunate that they said “yes” and so I encourage you (if you can) to pick up a copy of issue 3 of the 103rd volume of the University of Alberta’s student paper The Gateway.